Earlier this week Hugh invited me to participate in the Black & White Photography Challenge, by posting a B&W photo each day, for a total of 5 days. I have really enjoyed looking at things in a different “Light”. My last photo is something I keep on my hall table, it belonged to my Nan and reminds me of her every time I come in my front door. 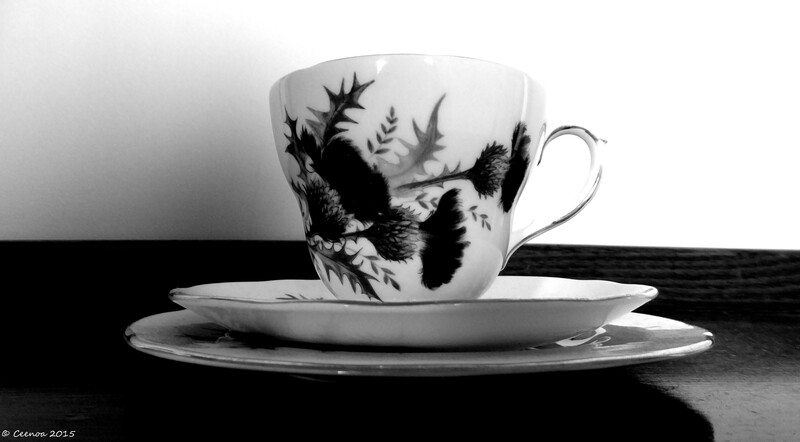 Day 5 – Teacup, Saucer and Plate. A very nice capture for the B&W photography challenge. I can’t believe you have reached day five already. I hope you had as much fun as did with the challenge. I have had a great time Hugh, thanks so much for inviting me. I can now imagine a world of photos not in colour. There may be more in future, perhaps a special B&W post feature. I’m thinking along the same lines, Claudette, and will certainly be publishing more black and white photos. In most cases they certainly can tell a different story than the colour version. Yes, and do you find sometimes your mind supplies the colours if you look long enough? Haha, not quite, but then I’ve only just started to look at black and white photography more closely recently. I will now, now that you have said that.